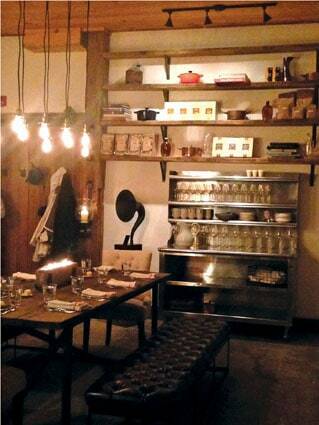 PITTSFIELD — The Backroom offers a new intimate dining experience unique to the area. Chef Kevin Lasko and Katie Stiles opened the kitchen and communal dining room the first week of February to share their passion for food and entertaining with others. The restaurant is essentially the private kitchen of Chef Lasko and the dinner service reflects as much. Guests join fellow diners for a communal dinner party in the kitchen. The menus will be ever-changing with the seasons and availability of local ingredients, explained Lasko. “We source as many ingredients as we can locally,” he added. Lasko prepared each course to perfection as Stiles served the dishes and answered questions from inquisitive guests, Friday, Feb. 6. Currently, the Backroom offers one seating on Fridays and Saturdays, beginning at 5:30 p.m. with cocktails and hors d’oeuvres. The three-course dinner begins at 6 p.m. The three course menu is currently offered at $35 per person, excluding beverages, tax and gratuity. Reservations are strongly encouraged as seating is limited to about 16. The Backroom is located in the Village of Pittsfield, behind the General Store, just minutes north of Killington on Route 100. In addition to public and private dinners, Lasko and Stiles hope to offer cooking classes and culinary events at The Backroom. For more information visit TheBackRoomVT.com.